How do we know Anne Frank’s dairy is authentic and not a forgery? Anne Frank’s diary is a forgery written by her father, Otto Frank, for monetary gain. Handwriting comparisons and forensic research of Anne Frank’s diary have shown conclusively that she was the author. After WWII, Otto Frank compiled and edited Anne’s diary. Because of the diary format, which promotes a personal and intimate style of writing, Otto noticed that many entries included embarrassing details or family conflicts. He sought to remain true to Anne’s writing while saving his family the pain of posthumous distress. These were all minor edits that did not take away from the themes and experiences Anne discussed in the diary. Later, the edited entries were restored to their original form, exactly as Anne wrote them. Researchers and scientists have proven that the diary was truly hers. In 1975, David Irving, who the High Court in London in 2000 declared to be a Holocaust denier, racist and antisemite, wrote in the introduction to one of his books on Hitler, that Anne’s diary was a “forgery.” Otto Frank protested to Irving’s publisher and the passage was omitted when the book was reprinted. Frank also asked the publishers for damages to be paid to the Anne Frank Foundation in Amsterdam. In November 1980 the Netherlands State Institute for War Documentation received all of Anne’s original diary papers , as directed in Otto Frank’s will. The State Institute conducted a definitive forensic and literary analysis of the diary using then state-of-the-art technology. Their report, which was published as The Diary of Anne Frank: The Critical Edition, is 719 pages long. The State Institute conclusively determined that the diary currently published as the “definitive” version is not a “novel” or a “literary fraud” but it is an accurate presentation of the original material. They also show that the diary pages were actually in Anne Frank’s handwriting and that the ink and paper were consistent with the time period. Does the diary show a level of maturity beyond that of a teenaged girl? This question—raised by Holocaust denier David Irving—is misguided from the start. One can certainly get the impression from Anne’s diary that she was a thoughtful, precocious child who took her education and writing seriously. Nothing that she wrote is out of step with what a teenage girl could write about—teenage crushes, war, sexual maturity, friends, family conflicts, etc. Whether or not Anne wrote with a maturity beyond her peers and beyond her years is not very good reason to doubt that Anne actually wrote the work. Anne certainly matured dramatically over the 25 months she spent in hiding, and this is evident in her writing style and subject matter. Anne spends considerable time in the diary discussing how she has in fact matured emotionally and psychologically. The war, and writing about it, transformed her. Before the reader’s eyes, Anne slowly turns into a more mature young woman who thinks and writes beyond her age of 15. Anne Frank’s diary was not written by her father, Otto Frank, for monetary gain. 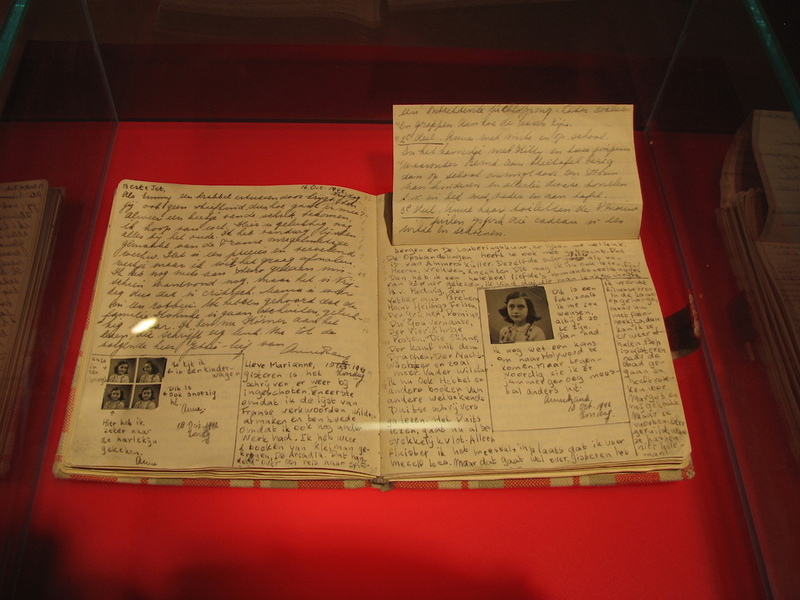 The literary and handwriting comparisons and the forensic results on the diary’s paper and ink done by the Netherland State Institute show conclusively that Anne Frank was undeniably the author of the diary. Otto Frank compiled and edited his daughter’s writings, mainly to smooth out family tensions and to exclude potentially embarrassing material. He still tried to remain true to diary. Today, the Netherlands State Institute for War Documentation has published the full, unedited diary. Similarly, the charge that Anne’s writing was too mature for a teenaged girl does not hold up to scrutiny. A thoughtful reading of the diary shows that Anne changed during the 25 months she spent in hiding; her diary entries document that change. Indeed, this is one of the reasons why Anne’s diary remains so powerful to so many readers. Anne’s Diary. By Heather Cowper www.heatheronhertravels.com [CC BY 2.0 (http://creativecommons.org/licenses/by/2.0)], via Wikimedia Commons. Richard Harwood, “Did Six Million Really Die?” (“Best Seller A Hoax”) at http://www.historiography-project.com/books. David Irving, Hitler and His Generals (Berlin: Ullstein Verlag, 1975), Introduction, p. III as cited in Netherlands State Institute for War Documentation, The Diary of Anne Frank: The Critical Edition (New York: Doubleday, 1988), p. 91, fn 53. David Irving, “Documents on Anne Frank and her Diary” at http://www.fpp.co.uk/Auschwitz/docs/controversies/AnneFrank/index.html.